Rays from welding points can damage different parts of the body such as eye retina and even harm the skin. That’s why it is strongly recommended that you go for the best welding helmet. Today, most welding helmets come equipped with auto darkening technologies to allow you to work in various working environments. They are also great for TIG (Tungsten Inert Gas) Welding, MIG (Metal Inert Gas) Welding, and Plasma applications. Additionally, most premium quality welding helmets have a wide viewing area to allow you to do a good job every time. 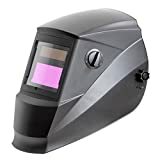 We have talked about them comprehensively in the following top 10 best welding helmets in 2019 reviews. This welding helmet is ideal for TIG, MMA, MIG, and Plasma applications. It has a large viewing size of 3.86-by-1.73 inches to allow you to view whatever project you are working on. It also comes equipped with four premium sensors as well as boasting lightweight craftsmanship for easy use. Also, this welding helmet has Step-less Delay and Sensitivity Knob adjustable. Because of its versatility, the welding helmet can be used on welding, grinding, and cutting applications. Efficiency and safety are a priority at any workplace. And that’s exactly what the Jackson Safety Auto Darkening Helmet (46101) offers. It has high-performing WH40 Series Auto Dark Filters, which enable it to deliver unmatched performance. To be precise, these filters work by allowing welders to adapt to different working environments. And they achieve that by enabling them to control the shade of the lens. 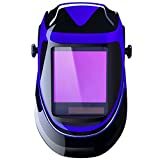 What’s more, this welding helmet has a wide viewing area to make sure that users can see what they are doing very well. This welding helmet complies with CSA and ANSI Z87.1+ standards to give you peace of mind knowing that it is quality and safe. It has an auto-darkening filter that will let you adapt to a variety of working environments simply by controlling the shade of the lens. Furthermore, this welding helmet can be used for MIG welding, ARC welding, and TIG welding since it has many different grind and weld modes. The welding helmet works with HLX100 and HSL 100 shells. And it is equipped with sensitivity and delay adjustments. It is simply to be comfortable and safe while doing the welding. That’s why we have thought it wise to include this welding helmet on this list. It has four independent auto dimming sensors that work with easy-to-use digital controls to give the best results. 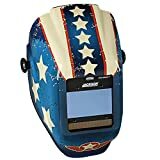 Additionally, the welding helmet has a wide viewing area of 3.93 inches X 2.36 inches to make sure you can conveniently see the projects you are working on. With it, you will be able to select from grind and weld modes. 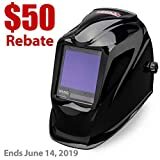 This welding helmet will let you work on some welding projects including ARC welding, TIG (Tungsten Inert Gas) welding, and MIG (Metal Inert Gas) welding. The welding helmet is made of a lightweight yet surprisingly durable material to make sure you are less inconvenienced while using it. 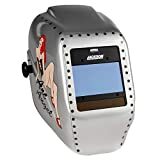 Besides, it boasts a revolutionary new design that features convenient external controls as well as adjustments for sensitivity, dark state, and helmet. Well, the new design allows you to do all of these without having to take off the helmet. 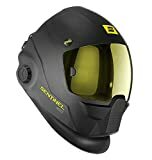 The SENTINEL A50 Welding Helmet features a revolutionary shell design that makes it strong as well as allowing it to withstand any task. It is also designed with ergonomics in mind, so it can offer optimum comfort while it is under use. Its viewing area is 3.93-by-2.36 inches to allow you to see whatever project you are handling well. Also, this welding helmet is equipped with a color touchscreen control panel that features eight separate memory settings. Although it is expensive, it is worth investing on, considering its performance and build quality. 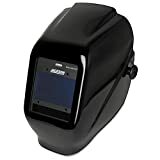 The auto darkening filter allows this welding helmet to switch from light to dark in just 1/25000 sec. 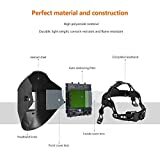 Should there be an electric failure, this welding helmet ensures that the user remains protected against IR and UV radiation according to shade 16. 1/1/1/2 rating. It is equipped with sensitivity and delay settings that are adaptable for a variety of environments and task duration. The solar panel technology powers the battery to make the welding helmet a reliable unit. This helmet is fatigue-free and very comfortable. Although this auto-darkening welding helmet is not designed for “overhead” welding applications such as laser cutting and laser welding applications, it is still worth considering. This is because it has good features like four independent and redundant arc sensors as well as an auto-darkening super view lens. The helmet also comes equipped with pre-installed retainer clips to hold cheater/magnifier lenses (not included). It is available in 3 different colors, which are inferno, tattoo, and black. With it, you will be able to tackle some welding tasks effortlessly. Like other highly rated helmets, the Lincoln Electric 3350 Series Welding Helmet has a perfect viewing area of 3.74-by-3.34 inches. It is a durable welding helmet that’s made of polycarbonate and nylon, so it can give the best performance without sacrificing comfort. Also, another feature that makes this welding helmet get a place on this list is the four arc sensors. Plus it has a switching speed of 1/25,000 sec to improve its performance further. The helmet is worth spending on if you are after incredible results. Welders should be protected. And one of the best ways to achieve that is to use the TACKLIFE PAH30D Welding Helmet every time you are welding. The helmet is made of a lightweight material that is durable, flame retardant, and corrosion resistant to make it reliable. What’s more, this helmet is powered by a solar cell and CR2450 lithium battery to make sure it is eco-friendly and long-lasting. It meets CSA Z94.3, EN379 CE, and ANSI Z87.1 standards. Its viewing area is 3.94-by-2.87 inches, which is large enough for ultimate convenience. Not all welding helmets are the same. For this reason, it is advisable that you take your time and go through some reviews. Well, one of the studies that you should certainly consider is this one. This is because products listed here have been thoroughly researched. Moreover, they are from reputable manufacturers.